4.3 out of 5 based on 229 bloggers and 35 commenters. 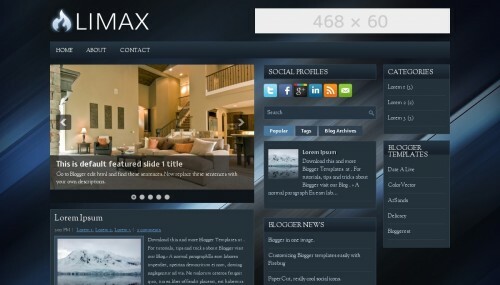 Limax is a free blogger template adapted from WordPress with 2 columns, right sidebar, ads ready, footer columns, slider, social bookmarking icons, posts thumbnails, tabs and abstract. The theme is missing the style.css stylesheet….so it says when i try to upload the zip. Can anybody help me with this please? Thank you. i appreciate yr template………. this template is 2 good………. i shall try to use my blog………. This template is perfect. It’s also great when your editing the code, it’s so easy. how to edit header. the space for logo is too small. how can i widen it. Please tell me, How to change slide show photos In this template? This is really cool! But how can you change the slideshow pics? Can someone please help me. how to change the default features slide ?? I don’t understand how i can use this one. Can somebody help me?